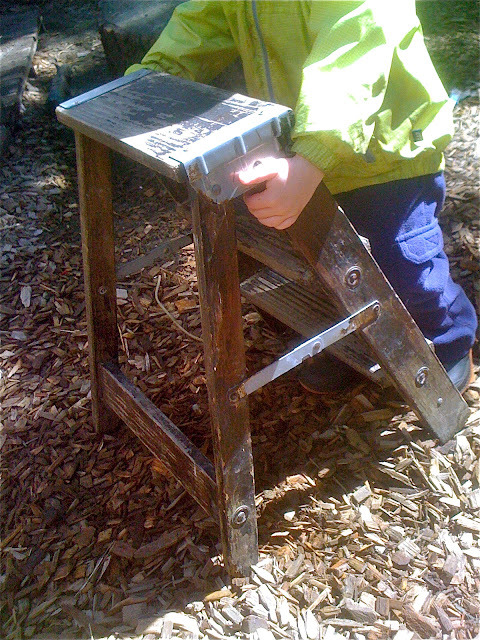 Teacher Tom: "I'm Done Now"
He was holding our step ladder, almost as big as he is, the one I stained a brown to match the floors in our old house when my daughter was his age, standing up above the garden. "You want me to help you, but I don't know what you're trying to do." 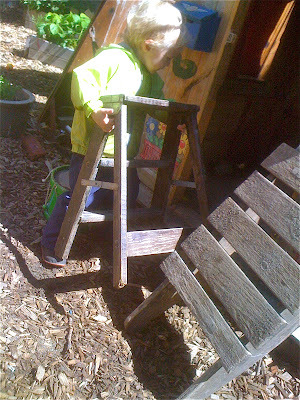 With an exaggerated exasperation worthy of a teenager, he answered, "I'm moving this ladder." I nodded that I understood without making a move to help. 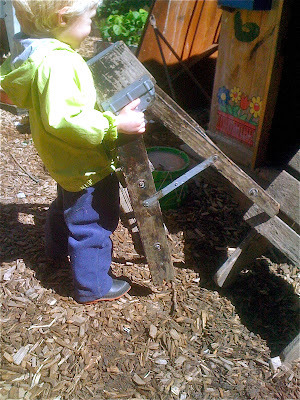 He turned and hoisting the ladder as high as he could, attempted to lift it onto one of the tree stumps that ring our sandpit. Not being quite tall enough, not having arms quite long enough, the legs of the ladder didn't clear edge, missing by a couple inches. After wrestling to stand it upright for a minute or so, he resorted to lying it on its side. 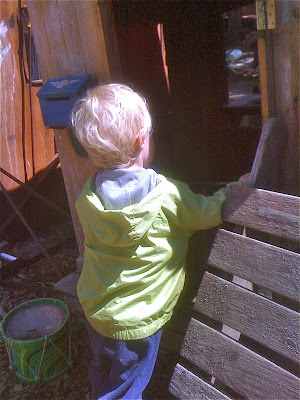 Then he turned to me, "Help me," holding up his arms to be lifted, apparently up into the sandpit with the ladder. He's been up and down that rise all year long. Help is not something he needed, it was something he wanted. Sometimes "Help me," means, "Play with me" or "Notice me" or "I want to connect with you." I doubt he remembered in that moment that it was the last day of school. I'm sure someone had told him, but when you're barely three it's hard to understand that a part of your life's rhythm is going to change until you wake up one morning and it's gone. Maybe this morning he's asking his mom, "Is it a school day?" As he struggled with the stepladder even I wasn't yet aware that he wasn't returning next year like most of his classmates. Neither of us knew that this was the last time we would be together as student and teacher. I said, "I'm going to climb up," and I bent down to clamber into the sandpit on my hands and knees the way I'd seen him do it dozens of times over the course of our long school year. He imitated me, then we stood together looking at that ladder, lying on its side. He returned it to its upright position, then lifted it into the air and began walking along the tops of the tree stumps. 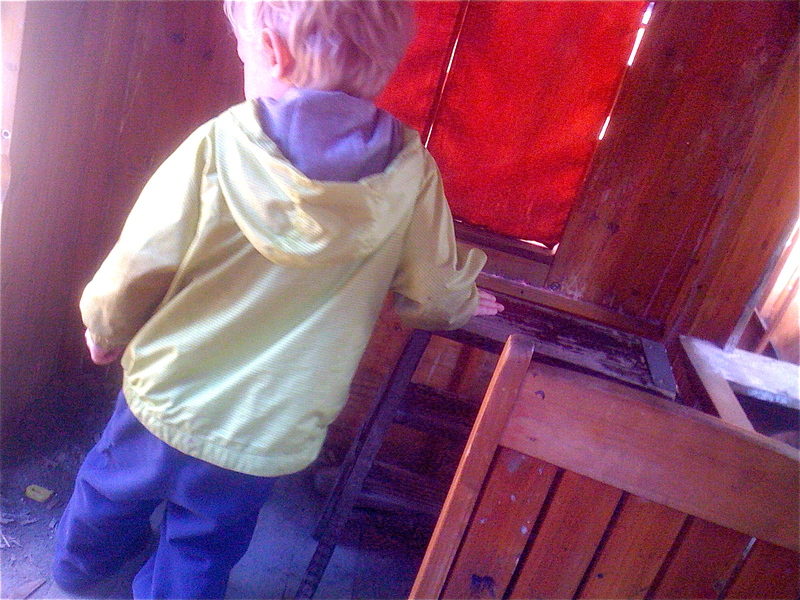 When he got to the playhouse he stopped and said, "Help me." "I don't know what you want me to do." "I want you to put it down here," he answered, bending to stand the ladder on ground where he wanted it, then dropping to his knees to follow. I said, "You helped yourself," but he didn't appear to hear me. He lifted the ladder again, then attempted to squeeze it and himself between the playhouse and the backside of the windmill sculpture. The ladder's legs again got in the way, catching on some of the windmill's support hardware. His face flushed red with the effort, turning the ladder and his body this way and that without success. If he had said, Help me, again, I was ready to answer, That gap looks too narrow for the ladder, but he figured it out on his own, finally dropping the ladder and untangling his legs. 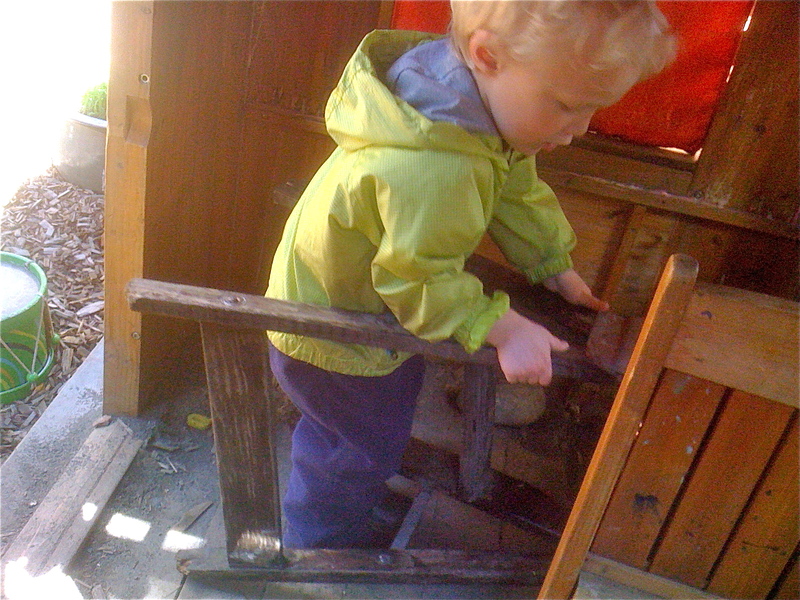 He picked up the ladder again and carried it around the other side of the playhouse to the door. It's not clear to me whether or not this had been his destination all along, but when he got there, he attempted to fit the ladder through. There were several minutes of struggle before it was finally inside. He stood it on its legs, then gave it a final pat before leaving it there. 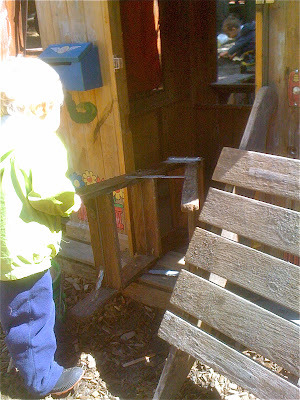 As he emerged, he met one of his friends carrying a chair toward the playhouse door, apparently having been inspired by his efforts. I said, "I helped you." He looked at me and smiled, paused, then said, "Yes. I know that. I'm done now."